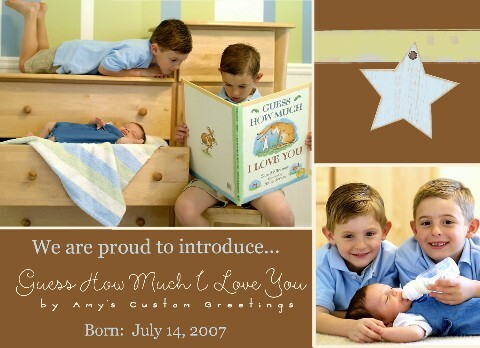 Amy’s Custom Greetings was born out of the love that I have for giving a personal touch to gifts for family and friends. My first digital card came about after I had spent hours and hours making holiday cards, scrapbook style. I enjoyed the process, but life was busy. With two crazy boys and one more on the way I was a busy mom, not to mention my job as a teacher, wife, daughter, sister and friend. It was hard to find time to be the scrapbooker that I once was. I still wanted to give that personal feel to my cards but needed to do it in a more timely way. The first digital card that I sent out for the holidays brought as much delight as my scrapbooked cards had and took me MUCH less time to create just one and make 100 copies. I started making digital invitations for events in my family and for friends. Then along came Rebecca! Rebecca is a friend as well as a talented photographer, heading the same direction that I was…going digital. We hooked up and I started making birth announcements and holiday cards from the photos that she was taking. Here is a recent photo that Rebecca took of me and my newest lil’ angel. Click here to order a copy for whoever YOU love more!